Use the construction below to investigate the circumcenter of a triangle and answer the questions below. 1. What is the name of the 3 lines constructed above which intersect at the circumcenter? 2. 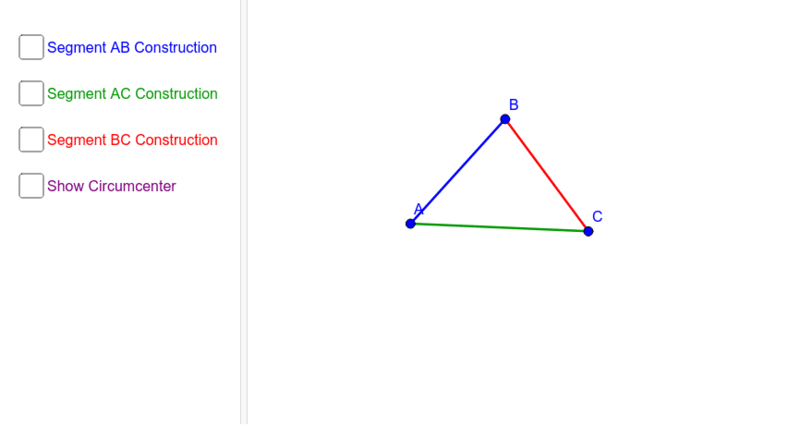 What is special about the circumcenter and the vertices of triangle ABC? 3. What is the location of the circumcenter compared to the triangle, when the triangle is acute? 4. What is the location of the circumcenter compared to the triangle, when the triangle is obtuse? 5. What is the location of the circumcenter compared to the triangle, when the triangle is right?